HD videos are becoming more and more popular due to its high video quality and enjoyable visual effects. Many videos downloaded from the web, taken by HD camcorders, purchased from stores are in HD formats such as MTS, TRP, MKV, AVI, MP4, etc. If you have got some HD videos and want to burn HD video to DVD either for backup or to watch the videos with family and friends on the big TV screen, then you've come to the right place. In this article, you will learn how to convert HD video files to DVD disc with ease. To convert HD video to DVD, you need a HD video burning software. Compared the price, function and burning speed of the DVD burner on the market, here we have chosen Aimersoft Windows DVD Creator to help you finish the task. With it, you can easily convert HD videos in any regular format to DVD disc in just a few mouse clicks! What's more, the built-in video allows you to personalize and touch up your videos. If you are using a Mac, you can turn to Mac DVD Creator. Get the DVD burner now and follow the steps below to burn HD video to DVD. Click the "Import" button on the main interface to add the videos you want to burn. All loaded videos can be previewed on the right as the below picture shows. You can drag and drop the videos to adjust the sequence. And the bottom green bar shows the sizes of the added videos. If you don't want to do any editing, you can directly go to the "Burn" tab and set the burning parameters. Then insert a blank DVD disc to your DVD drive and tap the "Burn" button to start burning HD video to DVD disc. You can also save the videos as DVD Folder or ISO for later burning. Tips: You can select the video clip and choose "Edit" to customize the video by cropping, trimming, rotating, adding watermarks, etc. as you like. And lots of free DVD menu templates are provided. Go to "Menu" tab and select the DVD menu template you like and then customize it with your favorite buttons, frames, photos, music, etc. to make a unique DVD menu. Great Site.... I am looking for a DVD burning software whereby I can select only a portion of the downloaded video stream to burn. In other words it is a conference and I only want to burn one talk of the stream. Can you help? Thanks. Hi,Jennifer Alves. 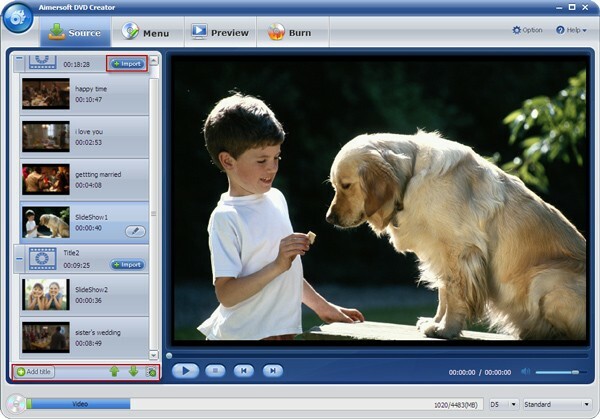 If you have problems with downloading HD videos, you can try Aimersoft Video Editor. This program lets you download videos from 1000+ websites. If you have trouble in burning video, you can contact us with the specific problem. I have the Aimersoft DVD creator and I am having trouble downloading my HD videos clearly. I had no problem when they were not HD but I am having trouble with it now. Why?